On the evening of Good Friday, we are at the nadir of the Easter story. The dark before the dawn. To a Christian, this is the crux – literally – of Holy Week, the most profoundly significant week of the calendar. Unfortunately, however, I was unable to go to church as I wished today, as it seems to be my turn to be struck by the nasty chest infection that has been doing the rounds of the family. While my husband went to church alone, I spent some of the afternoon sitting in glorious warm sunshine in the garden, feeling (as my Dad would have said) very feak and weeble. My younger son and the dogs had a wonderful time enjoying the first really summery weather of the year. As I can barely speak above a whisper today, they could pretty much do as they liked. I sat and dozed, and reflected on today’s events in the Christian year. I also reflected on what I have realised during this Lent: that lack of self-confidence can lead to a sort of egotism, as one’s thoughts turn anxiously in on oneself. Thus even someone who feels quite humble can be guilty of the sin of pride. Now there is a humbling thought. I don’t think that I had ever really understood that before. So many of my friends are so much more giving of themselves than I am: generous in time, thought and action. For most of them, it has nothing to do with conscious faith (practising Christians are in a minority here these days, even if the Prime Minister has just ‘outed’ himself as one). Believer or unbeliever, the danger of being too introverted is that you can be so busy thinking negative thoughts about yourself (‘I’m not the right person to help’, ‘I’d be useless at that’, ‘They wouldn’t want me‘) that you forget that most of the time in life it’s not about you. So I have been remembering C. S. Lewis’s wise words, repeating them like a mantra every time the negative voice in my head threatens to drown out the needs of someone else. It’s amazing how useful you can be once you stop thinking about how useless you are! Perhaps you are someone who has always known this, in which case you might think I’m a little slow on the uptake. That’s one of the wonderful things about growing older, though, isn’t it: there is always more to learn. Personally I find Lewis’s words very cheering and encouraging. ‘Mummy, you’re so lucky,’ commented my son the other day, looking around the kitchen at all the cards propped up on shelves. ‘You get Mothers’ Day, and then soon after that it’s your birthday, and next it’s Easter. You get lots of cards and cakes.’ Well, yes, I have always liked April for that reason, although, as I pointed out to him, it is me that makes the cakes. I’m quite happy with that, however. Perhaps one of the best things about being useful is that you get to have your cake and eat it. Talking of which, I’d better finish marzipaning the Simnel cake before I drag myself off to bed. Then my family and friends can look forward to the joy of Easter Day…and cake too. And after these slightly incoherent thoughts (blame the lurgy), may I wish you a very happy Easter on Sunday! 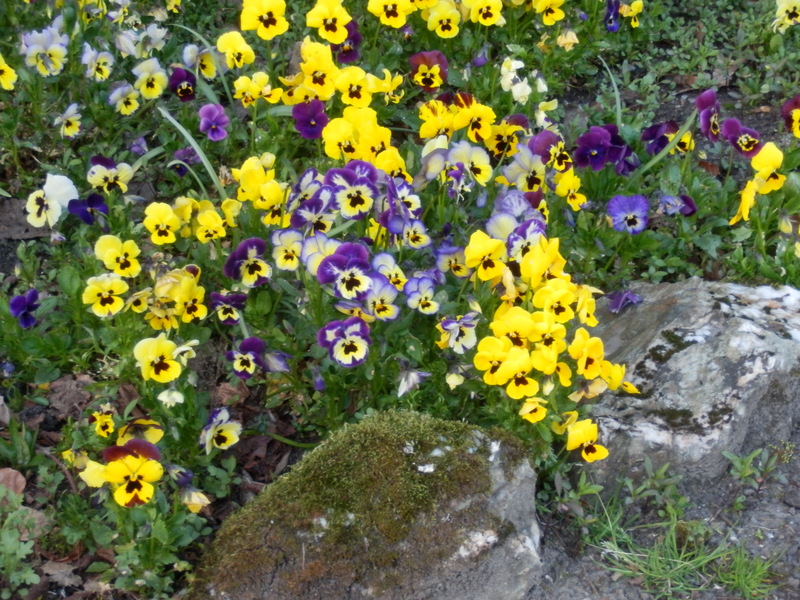 Pansies in the garden, making the most of the Easter sunshine. I wrote on talking with children about Christ’s Passion and Resurrection in Children and the twist in the tale; and a little about Holy Week in Malta here. As an artist and writer, I find myself spending a lot of time focused on my own creative processes, and I feel incredibly self-centered at times. I struggle back and forth with the notion that I should do more for other people, and at times, I become so sick of myself, it is a great relief to go visit my sweet 96-year-old neighbor or spend volunteer hours here or there. But I also think that those of us who are called to creation, as you appear to be in your generous, enriching blog, perhaps should cut ourselves some slack. What we create is a gift to others that can connect the lonely and lift souls. The hard thing is, we rarely know of the impact of our work. It helps to think of how we enjoy experiencing the creations of others and dare to imagine that our work gives others the same thing. Oh, Nancy. You have really given me pause with your kind and thoughtful words. Yes, I will ponder what you say, as I know you are right….balance is all. Thank you. Thank you. These are thoughts to contemplate. I hope that you are feeling better soon to enjoy some sunshine. 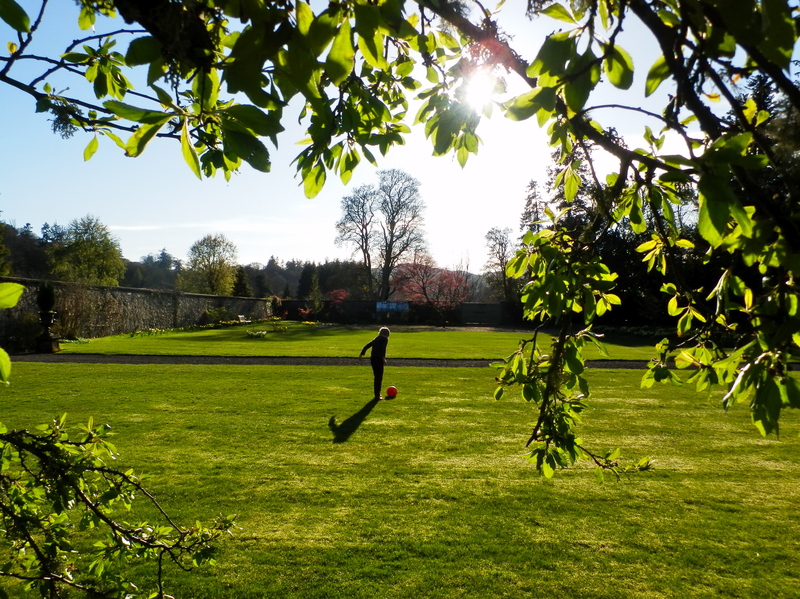 We have had glorious weather, luckily for us, thank you. I hope you enjoyed your weekend too. I do agree with your first commenter, and I would like to add that, having read your blog for quite a while now and seen how deeply you care for your family, you really shouldn’t feel that you’re not giving enough of yourself. And sometimes you just have to pause a little bit in the giving, in order for the well to fill up again, which might be what your body is telling you! I really hope that you are feeling fit and well soon – this dose of sunshine will do you good. That Simnel cake will be wonderful (I have made one myself, unfortunately Colin is taking rather too much pleasure in eating the Apostles). Thanks very much for your kind and sensible advice. The sunshine has certainly been a tonic to us all. A joyous Easter, belated birthday greetings and get well soon, DB. Nancy’s words are very wise and true and I’m quite sure you do a great deal for others, both in daily life and through your blog. I love those words of C S Lewis, which I hadn’t come across before and I will ponder them amidst the Easter joy. I hope you feel well enough to enjoy the cake. Thank you, Perpetua. I can’t remember where I came across that quotation from C. S. Lewis, but it has certainly struck home for me. The image of the oxygen mask is extremely helpful, too, and one I will keep in mind from now on. Thank you for all of this. I hope you had a lovely Easter weekend, as we did despite the lurgy! Our pansies have already given up in the heat. Sigh. Really enjoyed the last few cool-ish fronts. Lewis is such an interesting author. I enjoy him more now than when younger. Thanks for his quote about humility/self. He seems to have the perfect way of expressing everything. And Lewis is a prime example of what you all are talking about: a writer, teacher, and speaker–so that is what he did as well as he could and look at all the people he is still influencing. This post and subsequent comments have resonated with me. Thank you. A belated happy birthday and I do hope you are well and truly over the lurgy! I too use the term “feak and weeble” – hee hee… and I hope you enjoyed all the cake -even though you had to bake it yourself!